The St. Lawrence River remains calm as the sunset lighting illuminates the sky above the city skyline of Montreal in Quebec, Canada. Soft pink and yellow hues blanket the sky while the buildings become illuminated as night settles in and the sun disappears for another day. 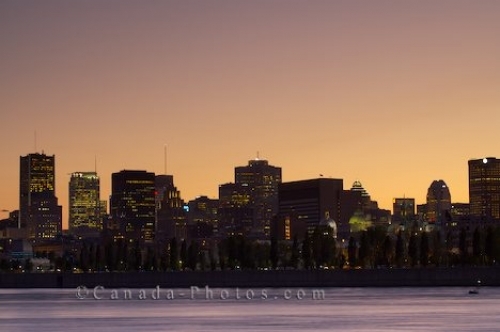 Hundreds of skyscrapers make up the skyline of the City of Montreal and from Navette vers le Vieux-Port on Ile Sainte-Helene, across the St. Lawrence River, the sunset hours are stunning. A row of trees are nicely planted along the waterfront which become silhouetted at sunset while the lighting reflects off the surface of the river. Picture of the skyline of the City of Montreal in Quebec at sunset with the St. Lawrence River adorning the foreground. ... The downtown core of Montreal City is extremely busy during the day as people come and go to work but as the sunset hues illuminate the summer sky, the skyline is one of the prettiest from the island of Ile Sainte-Helene. City of Montreal Skyline at sunset seen from across the St Lawrence River at the Navette vers le Vieux-Port on Ile Sainte-Helene, Montreal, Quebec, Canada.